Volume by SOFTlab was commissioned by HP for The Lab, an interactive experience combining many bespoke installations by various NYC based artists and curated by META, at the Panorama Music Festival in NYC. 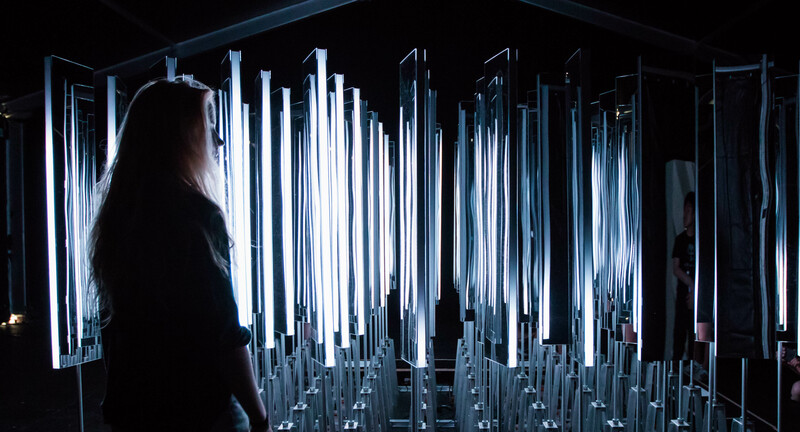 Volume is an interactive cube of responsive mirrors that redirect light and sound to spatialize and reflect the excitement of surrounding festival goers. The paired down details of the installation are meant to foreground the use of light and sound as fundamental building elements of space. The installation redraws the line between what is considered ephemeral vs. physical as the installation remixes space and the character of the festival goers while gazing back at them with empathy and exuberance. 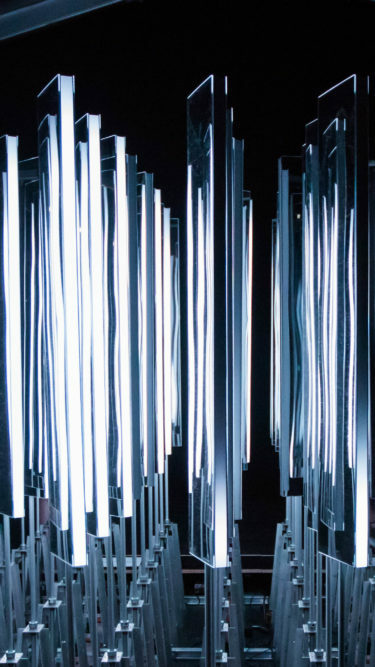 The installation was inspired by the ability of light and sound to form space through reflection and their dependence on atmosphere. Although we often consider this space empty, the air around us is a material made of many particles. Small changes in this volume of transparent material allows light and sound to move through space. The mirrors in our installation represent these particles acting in harmony to challenge and enhance what we see. The installation is made of a grid of 100 mirrored panels that each rotate individually. An array of depth cameras above track people as they move around the installation. Using a weighted average of the various people being tracked the mirrors rotate to face the nearest person. Individually addressable LEDs along the sides of the mirrored panels respond to the ambient sound in the space around the installation.